On Oct. 14, 1912, John Flammang Schrank shot Theodore Roosevelt in Milwaukee, Wisconsin while Roosevelt was campaigning. Roosevelt was running for a third term as president at the head of his newly formed Progressive Party. His opponents were Republican incumbent William Howard Taft and Democrat Woodrow Wilson. As Roosevelt was leaving a dinner for supporters at the Gilpatrick Hotel, Schrank stepped forward and shot Roosevelt with a Colt revolver chambered in .38 S&W — possibly a Police Positive or an M1892 Army & Navy. Schrank purchased the revolver before he left New York to begin his pursuit of Roosevelt’s campaign across eight states. He finally got his shot at Roosevelt just after 8:00 P.M. outside the Gilpatrick. The .38-caliber slug struck Roosevelt in the chest, passing through his steel glasses case and a folded copy of the speech he was about to give. This slowed the bullet, sapping its energy before it entered Roosevelt’s chest, breaking a rib. Schrank was quickly arrested and Roosevelt, after coughing and seeing no blood, decided to continue to the Milwaukee Auditorium. He deliver a planned speech rightly believing Schrank’s bullet had not punctured his heart or lungs and his life was not in immediate danger. Investigation of Schrank’s diary revealed he believed he was following orders he’d received in a dream from Pres. William Mckinley, who himself had been assassinated. Doctors determined Schrank was mentally ill and suffering from delusions of grandeur. The assassin claimed he had shot Roosevelt to prevent the ex-president from breaking the then-unwritten rule that presidents should serve no more than two terms in office. Friends, I shall ask you to be as quiet as possible. I don’t know whether you fully understand that I have just been shot; but it takes more than that to kill a Bull Moose [in reference to the nickname for his Progress Party]. But fortunately I had my manuscript, so you see I was going to make a long speech, and there is a bullet — there is where the bullet went through — and it probably saved me from it going into my heart. The bullet is in me now, so that I cannot make a very long speech, but I will try my best. He went on to speak at length for 90 minutes before leaving for the hospital, where doctors probed and x-rayed his chest before deciding it was safer to leave the bullet in Roosevelt’s chest than to take it out. “I do not mind it any more than if it were in my waistcoat pocket,” he famously said several years later. Schrank spent the rest of his life in Wisconsin’s Central State Mental Hospital, where he died in 1943. Roosevelt was unable to continue campaigning but remained on the ballot. He and his Progressive Party won 27 percent of the vote share, beating Taft’s 23 percent and splitting the Republican vote, thus allowing the Democrat Wilson to win with 42 percent of the vote. It’s possible that, had he been able to continue his campaign, Roosevelt may have won the presidency again, but Schrank fulfilled his deluded ambition and prevented Roosevelt from serving a third term. 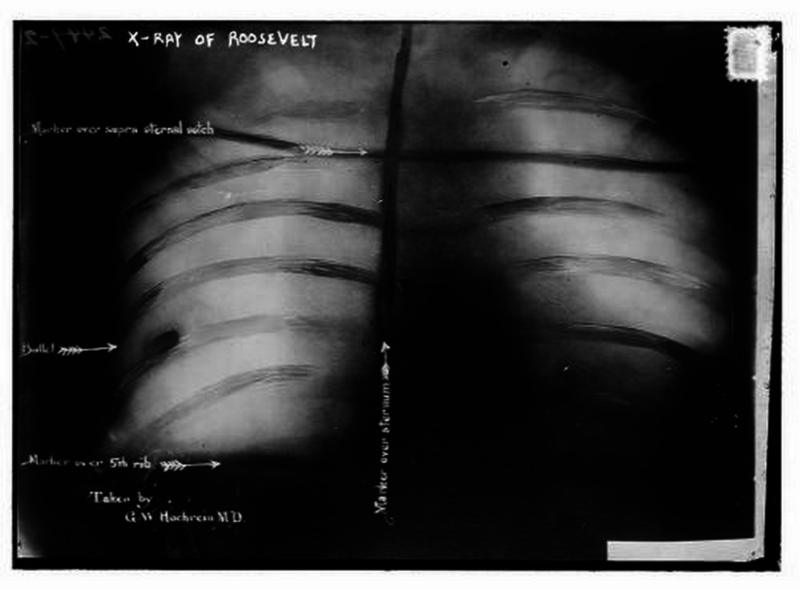 Roosevelt died seven years later in 1919, with Schrank’s bullet still in his chest.